David Priest lives in North Carolina with his wife Maribeth and their two children, Ryan and Ryley. He was born and raised in Pennsville, New Jersey. David is the youngest child of Louis James Priest III and Beverly Longacre Priest. He has two older brothers Marc and Stephen. David’s father Louis is one of five children born to Louis Priest Jr. and Helen Ferrelli Priest both of them born in the USA from parents who immigrated from the Italian region of Abruzzo. 1. Dave, when did you start to be interested in family history? I have always been interested in family history. I have a close family and both sides of my family are very proud of their ancestral roots. My father, Louis Priest III, is of 100% Italian ancestry and my mother Beverly Longacre Priest has ancestral roots in Ireland, Poland, Scotland, Germany, England and Sweden. I became serious about family history in 2003. I always knew all four of my dad’s grandparents came to America from Italy in late 1890’s and early 1900’s. I also knew all four emigrated from the region of Abruzzo and two of them were from the Province of Teramo. I was not sure of the province or the town that my other two grandparents came from at that time. 2. How did you collect main information? We had a “Priest” (Dell’Arciprete) family reunion in 2003 and my dad’s cousin’s wife shared a family history album with me. I was hooked from that point forward. At the reunion I found out my father’s other two grandparents came from a town in the Chieti province called Guardiagrele. I started collecting information with the family history album. My father’s cousin’s wife did a lot of research and had census records from Philadelphia, death certificates of my great grandparents, and also listed all of their offspring. She put many hours of work into the book and I appreciate all of her hard work. I wanted to take it further. I wanted to trace the family back in Italy which she did not have any information on. 3. What was the key for continuing your research? I started a tree on the Internet and started piecing together information. I had many conversations with my father about his cousins, aunts, uncles, and grandparents. I also asked his siblings and some of his cousins for information and they were very helpful too. From other family members’ trees, to other documents on Internet, I got a little further on the Dell’Arciprete side. I am lucky to come from an area in southern New Jersey that has many Italian immigrants. One amazing thing is the town my father grew up in had a high concentration immigrants from Abruzzo and many were from the village of Valle San Giovanni in the province of Teramo that my great grandparents came from. My father’s sister Helen married my Uncle John Gioia. My Uncle John’s father Tony Gioia was born in Valle San Giovanni, so I have a great connection to the town. My uncle, my aunt, and also my uncle’s friend have gone back to Teramo several times. Thankfully, through them, I was able to connect with a man in Valle San Giovanni that has sent me many birth certificates and marriage records that allowed me to piece together my dad’s mother’s side of the family. I was amazed to see a picture that was sent to me of my great grandparents’ house. I felt a real connection to who they were and where they came from. 4. Did you avail yourself of the help of a professional researcher/genealogist? Yes, I contacted a genealogist who was based in Southern Italy. This unlocked so much and enabled me to trace the family back to the XVIII Century. I eventually was able to connect my family tree to one of the five original Dell’Arciprete families that were present in the Bourbon Cadastre of Guardiagrele. 5. When did your Italian ancestors move from Abruzzo to the USA? My grandfather’s (Louis Priest Jr.) parents were Luigi Dell’Arciprete born 1876 in Guardiagrele and his wife Maria Belfiglio born 1877 also in Guardiagrele. They married in 1896 in Guardiagrele. Luigi immigrated on March 4th 1899 on the ship “Werkendam”. Luigi’s wife Maria and their two children Anna and Argentina came aboard the ship “Patria” on August 16th 1901. My Grandmother’s (Helen Ferrelli Priest) parents were Alessandro Giuseppe Ferrilli born in 1881 in Valle San Giovanni which is a small village near Teramo. His wife Annunziata Cacciatore was born in 1887 in Valle Soprana, a village next to Valle San Giovanni. They were married in 1909 in Valle San Giovanni. Alessandro and Annunziata immigrated together on April 18th 1909 on the ship “Duca Di Genova”. 6. What was the most exciting discovery of your research? The most exciting discovery I found out is that my family dates back to at least 1700 in Guardiagrele. I was so glad to trace the family back to one of the original Dell’Arciprete’s living in Guardiagrele at that time. I found my 6th Great Grandfather named Donato Dell’Arciprete was born around the year 1700 in the area. Another exciting discovery was to find out that my great, great grandparents adopted an orphan that was left on their doorstep in 1909 in Valle San Giovanni. I imagine this filled the void of their child, my great grandfather Alessandro Ferrilli, who left for America in 1909. It was outstanding when I found this document. My uncle’s father knew my great, great Ferrilli grandparents in Italy. He said they were so fun even though they were fairly old at that time in the 1920’s. He said they were always entertaining the children of the village and playing games. This story reminds me of my father in that he is always playing and entertaining children especially my children. My father obviously has inherited his love for children from his great grandparents. After I found the document stating they adopted an orphan that was left on their doorstep, I now know why they were always so fun to be around. They were raising a child late in life! 7. Your surname had been modified at some point, how and when did this happen? There were many different stories about how our surname changed. Many Americans think their names changed at Ellis Island which is not true. We heard our surname changed on the boat coming over by officials on the ship which was also not true as well. The theory that most of our family believes is that sometime after 1906 but before 1910 our name was changed. My grandfather’s older brother Antonio had the surname Dell’Arciprete on his birth certificate in 1906. But, by the 1910 census in Philadelphia the family was going by the name “Priest”. The story goes that nuns in the schools could not pronounce or spell Dell’Arciprete. They knew the ending “prete” meant “Priest” in English so they just started calling the children in school that name and the name stuck. Also, it was early in the wave of Italian immigration and I feel they might have felt the need to be “Americanized”. To my knowledge the surname was never changed legally. I guess my entire family is going by an unofficial last name! My father’s mother’s surname was also modified. This was mainly due to the language barrier. The surname of her father was Ferrilli in Italy, but when they came to America it changed to Ferrelli. 8. How many people are in your family tree at present? How many surnames? How many nationalities? I currently have 1477 people in my family tree. There are many nationalities and many surnames. My dad is of 100% Italian ancestry but my mom has many different nationalities. She is truly representative of the melting pot of America. She has roots in Ireland, Scotland, England, Germany, Poland, and Sweden. My wife Maribeth, is of Polish, Irish, and German ancestry so my two children are the epitome of what it is to be American whose ancestors come from all over the world. The surnames in my family from Guardiagrele are Dell’Arciprete, Belfiglio, Verna, Adorante, Colagreco, Carosella, Orlando, Di Prinzio, Rosica, Di Sciascio, De Titta, Di Cocco, Capuzzi, Cavalieri, Mastrocola, Taraborelli, and Ferrara. The surnames in my family from Valle San Giovanni are Ferrilli, Cacciatore, Di Donato, Bovi, Mattia, Mazzarello, Di Gennaro, and Zilli. 9. Did you ever end up going down the wrong path with your research without realizing it? The major problem was when my dad’s grandparents died, their parents’ names got reversed on the death certificate. With the help of a genealogist I received my great grandparent’s birth certificates and realized the names were reversed. Once I knew this, it unlocked so much. 10. Is there any part of your research that still needs a lot of work to be completed? Yes, there is still a lot work. I want to find where the Dell’Arciprete’s came from before 1700. The family is in Guardiagrele in 1700 but does not show up in Guardiagrele on the Pre-Onciario cadastre of 1609. Where could they have come from and what brought them to Guardiagrele? Also, I would like to know where the Ferrilli’s came from before they came to Valle San Giovanni. I have documents that say my ancestor and his brother arrived in the Teramo area in the early 1800’s from another village but it does not list where they came from. I would also like to know how and why they settled in the Teramo area. 11. When will you consider your research completed? Even though I am an amateur genealogist, a genealogist’s work is never complete. There are always more branches and of course you always want to take the family back further. It is just a hobby of mine but it is very interesting and is like putting pieces of a puzzle together. I feel I will be interested in this for the rest of my life. 12. Who is the person of the family that has the most interesting life history? I would have to say my great grandfather Luigi Dell’Arciprete had the most interesting life history. Although he passed away before I was born, I feel like I know the man through the many stories and pictures my dad and his family have shared. The reason I feel he is the most interesting is because tragedies he and his family overcame and bounced back stronger each time. He was the first of the four of my dad’s grandparents to come to America in 1899 and it took a lot of courage to leave Italy for new country not knowing the language or culture. He chose to leave his entire family in Guardiagrele in search of a better life in America. He not only left his parents and siblings, he also left his wife and two small daughters there. His wife and two children would join him in America. Luigi and Maria had 9 more children once the family was reunited in America (Philadelphia). Luigi and Maria had two children pass away while living in Philadelphia. One child died of disease and another died very tragically. Luigi and Maria made the decision to pick up again and move their family out of Philadelphia for a fresh start. The move to a farm in Southern New Jersey was another important decision that Luigi and his family took. Unfortunately another young child died of disease on the farm and another grown daughter passed away from tuberculosis as a young adult in Philadelphia. Luigi lived until he was almost 90 years old and he never went to the doctor in his life. 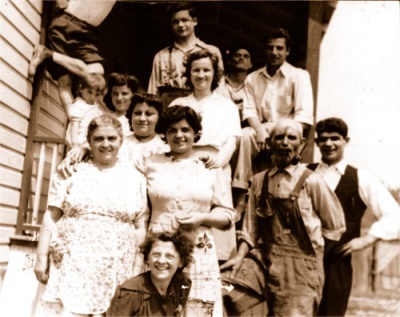 Luigi and Maria landed in America about 115 years ago, had eleven children, 32 grandchildren and now have over 250 descendants living in the United States. 13. Did you visit Abruzzo? How was it? I was lucky enough to travel to Italy after my wedding on my honeymoon. The final part of our trip was to Abruzzo which was wonderful. Unfortunately I did not get to visit with any relatives. We were lucky enough to make it to Teramo and meet one my friend’s sister who was living there at the time. She gave us a tour of Teramo. At that time my family had lost contact with our relatives in Italy so I actually did not get to see them. After my grandfather passed away, my grandmother would go to Teramo to spend time with her mother’s Cacciatore family each year. After my grandmother passed away our family lost contact with our relatives in Italy. Hopefully one day we can make a return trip to Italy and spend time with my relatives. My Aunt Helen and Uncle John were able to visit with them last year. 14. What did you think of towns you visited? Did you find your ancestor’s house? My wife and I loved our trip to Italy. We visited Rome and the Vatican, Tuscany with Siena, the Chianti area and Florence. But I have to admit the three days we spent in Abruzzo were the highlight of the trip for me and my wife. We chose to stay three days in Pescara because we wanted to be able to spend some time on our honeymoon on the beach. The beaches and water were beautiful and Pescara was a very nice place. Our day trip to Teramo was wonderful and I felt a connection to the town. It was wonderful to see the town where my grandmother stayed in Italy and the area where my ancestors came from. The mountains and landscape were so beautiful. I wish I could have spent more time there and got to hang out with my relatives. I wish I would have visited the house of my great grandparents while we were there. I did not know its exact location at the time. I am glad my aunt and uncle have visited the house and taken pictures of it. Who knows one day I may win the lottery and purchase the house for my family to enjoy! Of course my major regret is that we did not get to Guardiagrele. We really were in awe of how beautiful everywhere we went in Abruzzo was. From the town of Teramo, to the beaches of Pescara, to traveling by train through the beautiful mountains, Abruzzo is truly a magical place. 15. Do you have something Italian in you or in your everyday life? Growing up, people outside of our family and close friends never realized I had Italian ancestry because our surname was changed and I look nothing like my father’s side of my family. I inherited my mother’s northern European and British Isles looks. So, even though I do not look Italian, I feel closely associated with my Italian ancestry. One main reason is my family. All of my first cousins are on my dad’s side, and since all of them have both parents of Italian ancestry, we were usually surrounded with Italian culture. So, when our families would gather for functions there was always the Italian element with food. Growing up, Sundays always a huge Italian meal and it was always homemade. My grandmother was an outstanding cook who of course made everything from scratch. Her sauce and homemade pasta were outstanding. She taught my mother how to cook Italian food and told our relatives in Italy what a wonderful cook my mother was. My mom made homemade sauce every Sunday. Some other things I associate with being Italian is my love of Pizzelles and the Italian Christmas cookie Caggiunitti. My great grandfather and my grandfather made homemade wine. Even though I never have made wine I appreciate good red wine with my favorite kind being Montepulciano d’Abruzzo. Another reason I feel closely associated to being Italian is where I grew up that is an area where many people of Italian ancestry live. The town next to where I grew up is Penns Grove, NJ which is where my dad is from. Many people can trace their ancestry back to Valle San Giovanni. Many of my friends growing up had ancestors that came from the same village as my great grandparents so there was a big Italian element to the area. 16. How can other people help your research? One goal is to make contact with Dell’Arciprete cousins in Guardiagrele and hopefully meet them as well. All of the new family members I have met have been so helpful with sending pictures and information. I hope to continue to connect with them and other new family members as well. I am hoping through this article, I will be connected with other relatives who can give me more information on my family’s history. For more information or to get in touch with Dave, please use the contact form. Hi Dave I enjoyed reading your account of Abruzzo I've just begun my friends Italian tree I see names on your list my friend has also. His father was Arcangelo Orlando b 1920 Guardiagrele. He emigrated to Australia 1955 Arcangelos parents were Dominico Orlando and Maria di Scìasco Marias mother Giovina di Prinzio I'd love to touch base and see if we an find the common ancestor! Dear Dave, I read your story and I too am looking to make contact with distant relatives in Guardiagrele which is where my dad was born. Donato Rosica...he was 9 years old when he came to America with his mother, brother and sister. My Grandfather, Carmine Rosica went back and forth from Bronx, NY to Guardiagrele for about 6 or so years. My Grandmother Josephina Marie Rosica decided they were all going to NY when Mussolini got in power. My dad was born in 1919. I'm planning a trip to Italy in June 2019. My dad would be 100 years old had he lived today. Anything you can tell me (if you know) about the Rosica family would be helpful in finding someone who has a blood connection to me when I visit.